Consciously or not, Lépine was the most complete chronicler of life on the Seine in and around Paris from the 1860s to his death in 1892. From Charenton and Bercy to the east of the capital all the way downstream to Sèvres, Lépine's many views of the Seine provide a mini-history of Parisian patterns of work and leisure. His oeuvre divides into small pochades, often painted on small panels, and large, studio-concocted Salon paintings, often measuring as much as 110 x 170 cm. 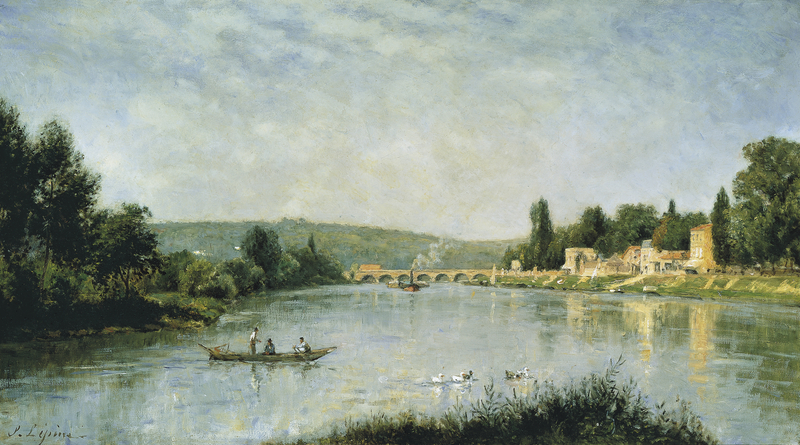 And there were many medium-sized canvases as well: witness here, for instance, this view of the Pont de Sèvres. The Pont de Sèvres figures in some five of Lépine's paintings. Three of these show the same view of river, bridge and coteaux, with minor variations in the disposition and emphases of the given elements. Two of the compositions are on canvases measuring 38 x 55 cm; the third-the present painting-is more ambitiously scaled. The three paintings are undated, and a bracket-date of 1876-1880 has been suggested. Like many French artists of the latter half of the 19th century, Lépine was much affected by the example of Corot. And throughout his career, he maintained an essentially tonal view of landscape painting, untouched by the Impressionist vision of Monet and Sisley. (Even though he showed in the first Impressionist exhibition of 1874, he was unaffected by their revolutionary procedures). A true and noble petit maître, Lépine pursued his quiet and lyrical interpretations of nature, so admirably instanced in this view of the Seine at the Pont de Sèvres.